Below are some of the documents produced by the Gibby’s Field Group. 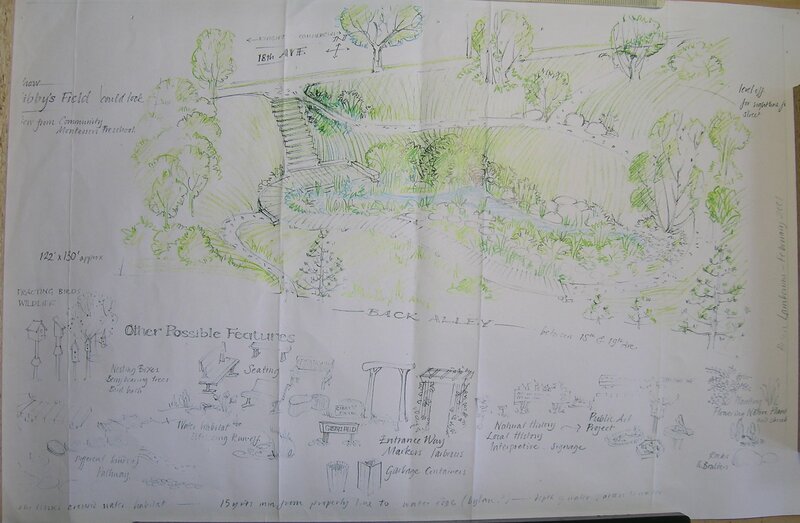 Probably of most interest are (7) the colour drawing by artist Helen Lambourne of how Gibby’s Field could look, (8) the five-page Gibby’s Field Report (in HTML or PDF) by Mavis Dixon, and (10) the seven-page Gibby’s Field Final Research Report (in HTML or PDF) by Arn Keeling. (1) 15 November 2000: Agenda: Gibby’s Field Group Neighbourhood Meeting #1. (2) 15 November 2000: Minutes: Gibby’s Field Group Neighbourhood Meeting #1. (3) 7 December 2000: Minutes: Kensington–Cedar Cottage (KCC) CityPlan Committee meeting. (4) 22 December 2000: Letter to Mayor and Council from Anne Roberts, KCC CityPlan Committee. (5) January 2001 (approx. ): Gibby’s Field information sheet produced by Mavis Dixon. (6) 12 January 2001: Minutes: KCC CityPlan Committee meeting. (7) February 2001: “How Gibby’s Field could look: View from Community Montessori Preschool.” Colour drawing by artist Helen Lambourne. (8) 10 February 2001: Gibby’s Field Report as of February 10, 2001 (in HTML or PDF) prepared by Mavis Dixon for the Gibby’s Field Group. Five pages. (9) 10 February 2001: E-mail from Mavis Dixon to Park Board Commissioner Clarence Hanson and others. (10) 29 September 2001: Final Research Report (in HTML or PDF) prepared for Gibby’s Field Group by Arn Keeling. Seven pages. In 2006, a second group of citizens rediscovered Gibby’s Field. This group is known as the Gibby’s Field Subcommittee and is affiliated with the Kensington–Cedar Cottage CityPlan Committee. The Gibby’s Field Subcommittee is trying to raise awareness about Gibby’s Field. Below are some of the documents produced by the Gibby’s Field Subcommitee. Probably of most interest are the (2) photos of Gibby’s Field by Jeff Nulty, (17) the two-page history article (in HTML or PDF) “Gibby’s Field, Moses Gibson, and Gibson Creek, Revised” prepared by Dan Fass, and (18) the 32-page booklet “Historical Walking Tour of Gibson Creek Through Kensington–Cedar Cottage” prepared by Dan Fass. (1) 21 October 2006: History article “Gibby’s Field, Moses Gibson, and Gibson Creek” prepared by Dan Fass. Two pages. Replaced by a new version on 11 March 2007 (4). (2) January 2007: Photographs by Jeff Nulty of Gibby’s Field. (3) 1 February 2007: Vision Statement for Gibby’s Field approved at KCC CityPlan Committee meeting, Trout Lake Community Centre. (4) 11 March 2007: History article “Gibby’s Field, Moses Gibson, and Gibson Creek, Revised” prepared by Dan Fass. Two pages. Replaced by a new version on 3 January 2010 (18). (5) March 2007: Article “Gibby’s Field: A Green Space with a Colourful History” by Dan Fass published in KCC (Kensington–Cedar Cottage) Neighbour (distribution: 15,000 households and local businesses and organizations), March 2007, Issue 6, page 6 (8.08 MB download). (6) May 2007: Flyer (in English and Chinese), prepared by Megan Turnock, announcing 13 May Gibby’s Field Picnic. (7) 12 May 2007: Photographs by Jeff Nulty of Gibby’s Field table at Plant Sale and Carnival, Tyee Elementary School. (8) 13 May 2007: Display “Gibby’s Field Past ...” by Community Studio. (9) 13 May 2007: Display “Gibby’s Field Present ... Future?” by Community Studio. (10) 13 May 2007: Photographs by Jeff Nulty of Gibby’s Field Picnic. (11) June 2007: Flyer (in English and Chinese), prepared by Megan Turnock, announcing 16 June Gibby’s Field Workshop. (12) 16 June 2007: Workshop report prepared by Megan Turnock. Photographs by Jeff Nulty of Gibby’s Field Workshop. (13) September 2007: Article “Update on Gibby’s Field: A Green Space with a Colourful History” by Dan Fass published in KCC (Kensington–Cedar Cottage) Neighbour, September 2007, Issue 7, page 6 (5.85 MB download). (14) February 2008: Launch of Gibby’s Field website. (15) March 2008: Article “Gibby’s Field Website” by Dan Fass published in KCC (Kensington–Cedar Cottage) Neighbour, March 2008, Issue 8, page 20 (4.4 MB download). (16) October 2009: Article “Gibson Creek Walk” by Dan Fass published in KCC (Kensington–Cedar Cottage) Neighbour, October 2009, Issue 11, page 4 (5.1 MB download). (17) November 2009: History booklet (in PDF) “Historical Walking Tour of Gibson Creek Through Kensington–Cedar Cottage” prepared by Dan Fass. 32 pages (1.25 MB download). (18) 3 January 2010: History article (in HTML or PDF) “Gibby’s Field, Moses Gibson, and Gibson Creek, Revised” prepared by Dan Fass. Two pages. (19) 13 April 2010: “Map of schools, colleges, and the China Creek watershed” (in PDF). Three pages (1.31 MB download). (20) November 2011: Article “Gibby’s Field to Receive One of 125 Places That Matter Plaques” by Dan Fass published in KCC (Kensington–Cedar Cottage) Neighbour, November 2011, Issue 15 (special historical issue), page 17 (7.8 MB download).